With school getting ready to start up again it's time to start thinking about school supply shopping. With the kids school lists growing longer and longer each year it seems I try to find the best bang for my buck. 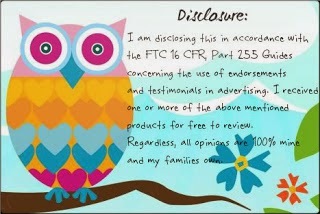 One way I do this is by finding brands that make quality products that will last for my children. 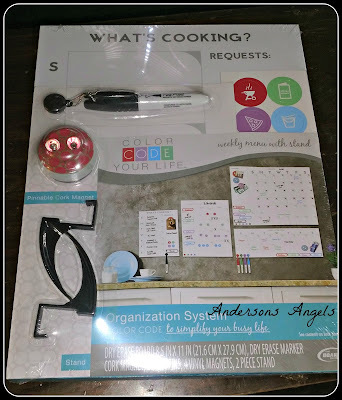 Some of the products that I have found that my kids and I really like are from brands like Scribble Stuff, U.S.A. Gold and The Board Dudes. 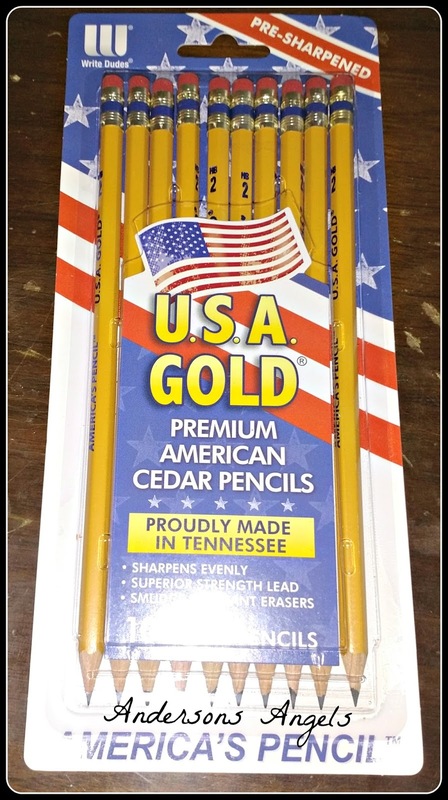 I have been a fan of the U.S.A. Gold pencils for awhile now. These pencils come pre-sharpened so no need to sit and sharpen all of them before sending them to school. The erasers do a wonderful job and do not smear the mistake all over your paper. They are made from premium cedar wood and are also made in Tennessee. So not only are you buying a quality made pencil but also helping keep jobs here in the United States. I am not sure about you but I love fun colored ink pens. I personally think they make taking notes fun and easier to remember. Scribble Stuff makes fun and colorful ink pens to meet your needs. They have colors like metallic, neon, glitter and classic colors for you to choose from. The pens have the comfort grips on them so they are comfortable to hold and large clips on them so you can easily attached them to notebooks. One thing that I am big on when school is in session is being organized when it comes to dinner, because of the crazy busy schedule we have. Things seem to get super busy once school starts because we also have cheer practice, football games, church and homework. So for me to keep a sane mind and be able to get dinners on the table before we have to run out the door I make a dinner plan/calendar so I know what I am cooking for the week/month. I do this by using a magnetic weekly dry erase board. The board comes with a marker, 4 vinyl and repositionable magnets as well as a cork magnet with 2 push pins. These are some products that I like and use daily while my kids are in school. What are some of your go to products? How would you like to win these products for your family? If You Would then be sure to stop back by during the Oh, The Places You'll Go Giveaway Hop that starts on August 9! I am on a colored pen insanity thing, I love making my planner all pretty with different colors! I'm getting hives just thinking about all the Back to School shopping I have to do! My go to is always a black gel pen. Colored pens would be a great change uo! My grandkids would love all this, even the ones that won't start school until next year. 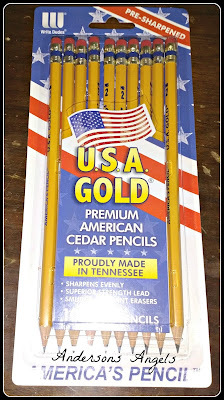 I love that these pencils are made in Tennessee! That makes them unique! I love the colored pens! I love to use colored pens to color my adult books. I like that they have a good quality of products and keep the jobs here in the USA. The menu board is fun! My must have is a calendar where I write everything down and save them all. They come in handy when trying to remember things and dates. I love the color pens and the weekly menu would be so much better than the white dry erase board we use now. Thanks for offering this super giveaway opportunity. I really need to be more organized with cooking now that I work outside the home part time. I've started cooking twice as much some nights and freezing half to help but organization is key! We use gel pens for everything. So pretty. The metallic ones look super fun. We love getting fun pens (different colors, gel) as well as planners and notebooks and binders. Makes it fun to have a backpack full of pretty things. 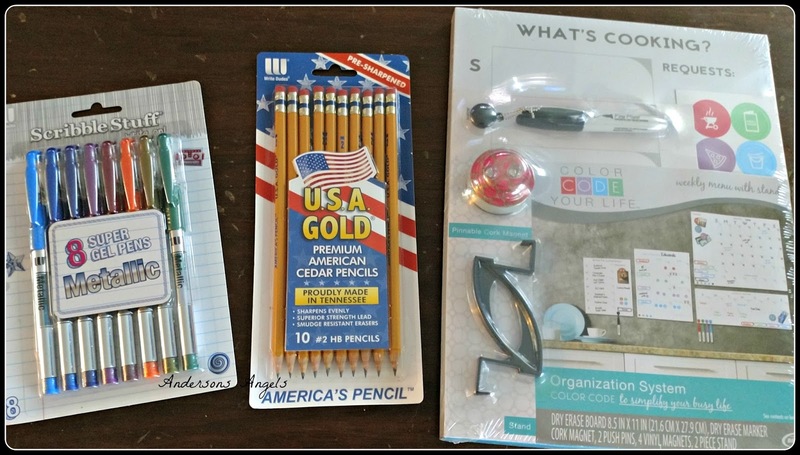 We love having good quality pencils for back to school as well as some fun pens! Those our the first things we look for when back to school shopping. I want to menu plan, so this would be helpful! Small binder clips... in all sorts of colors. I can't get enough! And each color represents a different subject area. We like the Pilot G2 pens and buy them every year. I really like the menu planning items. I always have trouble w/ posting my comments thru Google...ugh! I sent one already but it's not showing so here goes again - lol. Pencils and paper, backpacks and binders, lunchboxes and containers...plus a planner for me. I love writing with gel pens and love that these are metallic! My son would dig those gel pens. 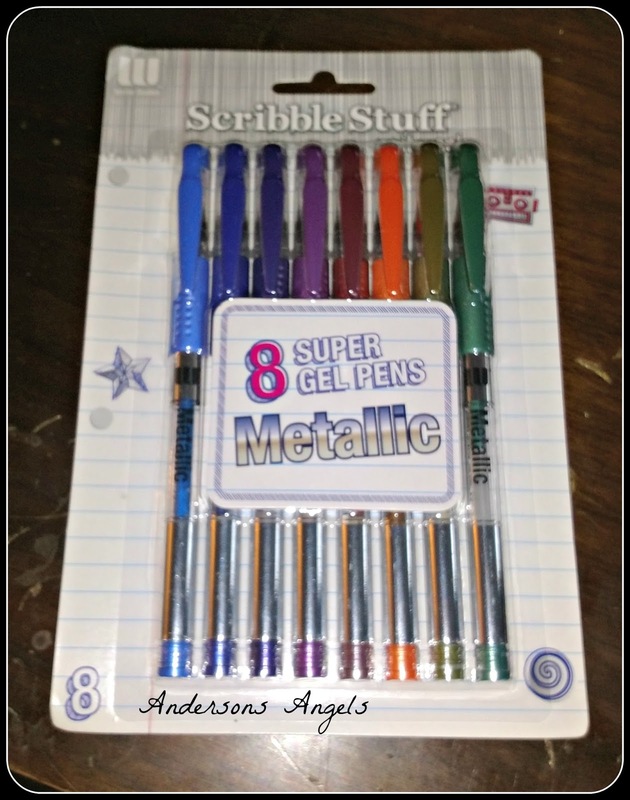 My daughter loves gel pens so I will be looking into getting these for her! I love gel pens and ones that are glittery and in pretty colors is even better! I tend to use just a regular small pocket calendar to keep track of things or my phone calendar. Our go to products are lots of paper & mechanical pencils. 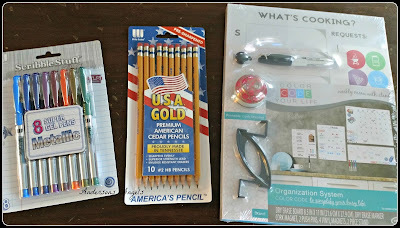 Stationary and back to school supplies are one of my favorite things. Back to school supplies are always an essential! These look great! I love the great quality! Great colors too! We go through so many pencils for homeschooling, and I love that these are made here in the United States. I love using those Scribble Stuff Pens and love the colors! I like the large clips on the pens. We use lots of markers, pens and pencils. My best friend swears by those pencils! I've heard they are fantastic quality. I have heard great things about the pencils. We love school supplies here. They are our favorite. I love those four color pens. Bic is my favorite. The package of a wipe off would be great for my daughter this year. I use colored pens to organize my calendars and each family member and their activities. Works great. Gold pencils are GREAT! I like using gel pens in different colors. I really need to get more organized with dinner. Having a plan would help, lol. I use my calendar in my phone, and I got an app that keeps a grocery list that I can share with the family so we all can add to it, and whomever goes to the store has the list. I enjoy the back to school shopping.I think this is fun! That schedule would be very useful for many people. We got scented markers this year and she absolutely loves them. They fascinate her a lot. It's adorable! Can never have enough gel pens. This pens would be great for my kids. School shopping wasn't too bad this year. I managed to get almost everything ordering online! My 11 year old would really love this. Those pens are really cute and she wants to be a chef when she grows up so the cooking calendar would be great. I would like to have the Metallic Pens. I love all the pens! I like the idea of a dinner/play calendar to plan meals for a week instead of each day. I like the What's Cooking Board. It lets everyone know what dinner will be on any given night. Pens, a variety of post it notes and loose leaf paper are a must in our house. Bic is the best and we also are obsessed with post it notes. One thing I loved about going back to school is having a fresh set of new supplies.